The family ancestry that I am currently concentrating my research on is Hyatt and Hyat, (which now also includes Waskett, Guppy, Westcombe and Varder) from 17th century and 18th century Sherborne and Castleton in Somerset (England) and nearby Dorset (England) as well as Shepton Mallet in Somerset (England). I am also researching the later victorian Hyatt lines of 19th century Hoxton, Shoreditch, Hackney, Essex, Middlesex in the London area of England. I am also greatly interested in the Hyatt, Waskett and Beazley lines from 19th century Essex (England) and Glass from 18th century and 19th century London (England). Although the bulk of our Hyatt family and database shown on our website is from the United Kingdom, we also have extensive Hyatt family research notes (not all included here) from the USA, including 17th century and 18th century Hyatt, Hoit and Hyett from Louisiana, New orleans, Texas and a few other states. Please feel free to Contact us if you want a search done of our U.S. database and sources. In the modern idiom the Hyatt family name has at least six spelling variations including: Hyett, Hyet, Hieatt, Highett, Highatt, and Hiett. In the past I have also found Hoyt, Hoit, Hoyle, Hoite, Hoytt, Hoitt, Hoyet, Hoyett, Hoyette, Hoyghtr, Hoight, Hight, Hite, Hyatt, Hayte, Haite, Hayt, Haight, and Hayls. The most commonly accepted Old English origin of the name HYATT is from Yatt - or In Old English geat/gaet, and in Middle English yatt and zett, which are all recognised now as Hyatt and meaning gate, opening or entrance to woods or land. It may however come from Roger (de) Ayeatt, one of William the Conqueror's henchmen (1066), who settled in England after crossing the English Channel from Normandy. One theory on the original French spelling up to the Norman Conquest and for 300 years later was 'Aiete', but the spelling of names then depended entirely upon the education and inclination of whoever wielded the pen, and we find it spelled Ayeatt, Aiete, Ayette, Ayot, Ayotte, Ayoye, Eyete, Aihate, etc. So it is not surprising to find as many variations if the 'H' was restored in post Norman invasion England. 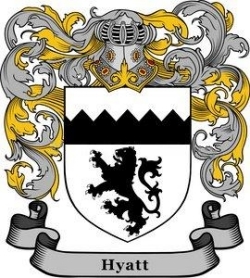 Until proven, for my branch of the family name I will stay with Hyatt being a relatively uncommon medieval English surname of residential or locational origins. It normally described somebody who was resident at "the High-Gate", which in this context may refer to the former village of Highgate, in London, or to other places so named, or to living by the high road, see below. Many local names like Hyatt usually denoted where a man held his land, and indicated where the family actually lived. Habitation names were originally acquired by the original bearer of the name, who, having lived by, at or near a place, would then take that name as a form of identification for himself and his family. When people lived close to the soil as they did in the Middle Ages, they were acutely conscious of every local variation in landscape and countryside. Every field or plot of land was identified in normal conversation by a descriptive term. If a man lived on or near a hill or mountain, or by a river or stream, forests and trees, he might receive that word as a family name. Almost every town, city or village in early times has served to name local families. The Hyatt surname spelling over the centuries was corrupted by changing dialects firstly to Hy-ate and finally to Hyett or Hyatt. To understand how this happened it is important to realise that in medieval English the letters "g" and "y" were synonymous, so that gate and yate could mean the same thing. To further complicate the matter, the word "gate" may mean a road and not refer to "gates" at all, but to "geats" or roads. "Geat" was a pre 7th century Danish-Viking word much used in England. Many of the streets in the ancient walled city of York, the former Viking capital, are called "gate", whilst the actual "Gates" to the city are called by the ancient British word "bar" as in Monk Bar or Bootham Bar. Consequently the surname Hyatt may also be interpreted as "one in residence at the high-road", as well as the more popular theory "one in residence at the High-Gate". An interesting name bearer was Rev. John Hyatt (1767 - 1826, included in this Hyatt family tree as my 8x Great Grandfather), a minister of the London church known as "The London Tabernacle". He published many religious tracts and sermons, from which he seems to have made a good living selling them onto other priests. 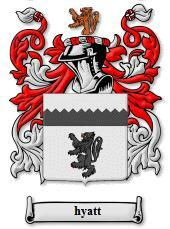 The first recorded spelling of the family name is shown to be that of John atte Hagheyate. which was dated 1327, in the Kirby's Quest of Somerset during the reign of Edward 111 of England. Edward high was recorded during the reign of Edward III (1327-1377) and William Higatt appears in the Yorkshire Poll Tax of 1379. James Hyett was Constable of St. Briavels Castle and Warden of the Royal Forest of Dean. 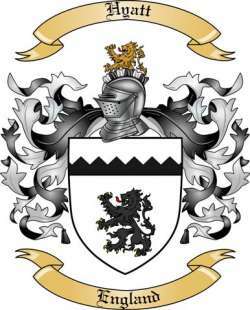 His descendants, James, and his son Roger, held the office of Constable and Warden from 1471-1483. Thomas Hiegate of Middlesex was registered at Oxford University in 1583. Richard Hyott and Anne Hatchman were married at St. Dionis Backchurch, London in the year 1651. Throughout the centuries, surnames in every country have continued to "develop" often leading to astonishing variants of the original spelling, not to mention that many names in pre-1700 records are in Latin. This, of course, makes it much harder to investigate earlier than 1700 or so. There are a more detailed notes on the origin of the Hyatt name here if you are interested.